The Witness traditionally marks the 25th (silver), 50th (golden) and 60th (diamond) anniversaries of ordination for priests of the archdiocese. There are four priests marking golden jubilees this year. 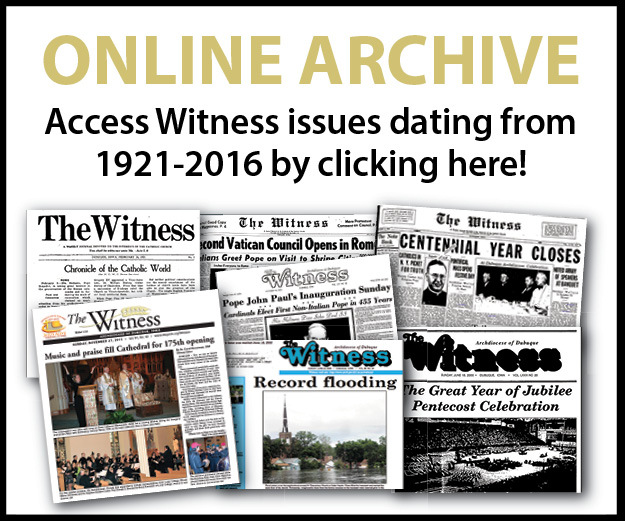 More articles on jubilees of priests and religious sisters will be published in coming issues. Father Daniel Knipper was born Dec. 27, 1941, to Andrew and Theresa (Bruggeman) Knipper of Dyersville. He graduated from Loras College and completed his theological studies at Mt. St. Bernard Seminary in Dubuque. He was ordained June 3, 1967, at the Cathedral of St. Raphael by Archbishop James Byrne. After a temporary as­sign­ment at the Cathedral of St. Raphael, Father Knipper served as associate pastor of St. Joseph Parish in Bellevue, 1967-73, while also serving on the staff of Marquette Catholic High School in Bellevue. Additionally, he taught music in the Bellevue public elementary school for one year. He served as associate pastor at Immaculate Conception Parish in Gilbertville, 1973-77, while also serving on the faculty of Don Bosco High School in Gilbertville. He served as associate pastor of Immaculate Conception Parish in North Buena Vista, 1977-80, while also serving as principal of Leo High School in Holy Cross, 1977-85. He was pastor of Immaculate Conception Parish in North Buena Vista, 1980-85, while also serving on the St. Mary School Board in Guttenberg. He was pastor of St. Agnes Parish in Plymouth Rock and executive coordinator and principal of Notre Dame High School in Cresco, 1985-89. He was director of the American Martyrs Retreat House in Cedar Falls, 1989-97, and also served as associate director of St. Stephen the Witness Student Center at the University of Northern Iowa in Cedar Falls, 1989-94. He was pastor of St. Mary Parish in Dike, 1991-97, and St. Mary Parish in Waterloo, 1997-2000. He became pastor of Immaculate Conception Parish in Lansing, St. Joseph Parish in New Albin and St. Mary Parish in Lycurgus in 2000, plus the linked parishes of St. Pius in Cherry Mound, St. Ann-St. Joseph in Harpers Ferry and Immaculate Conception in Wexford in 2010. He served in these parishes until his retirement in 2011. Prior to his retirement, Father Knipper also served for many years on the Archdiocesan Liturgy Committee. 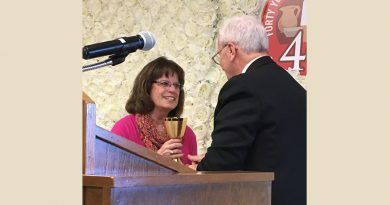 In 2016, he was appointed the spiritual advisor for the Archdiocesan Council of Catholic Women and continues that appointment in his retirement. He currently resides in Decorah (502 Valley Dr., #24, Decorah, IA 52101) and fills in as a substitute priest at local parishes as needed. 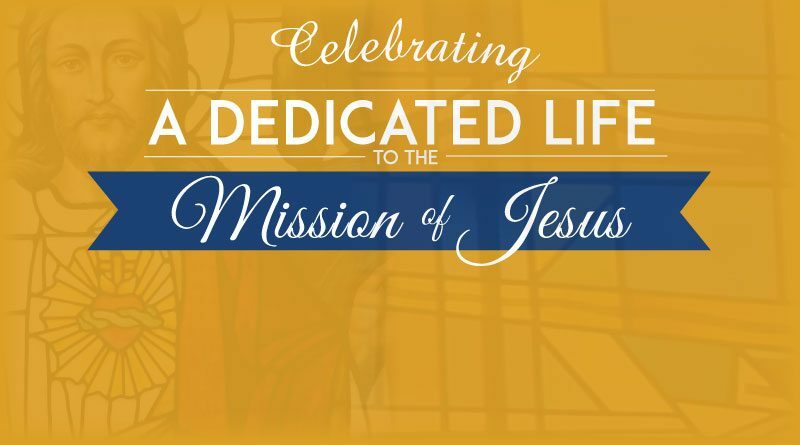 He will celebrate his golden jubilee with Masses of Thanksgiving on June 4 at 10 a.m. at St. Benedict Parish, Decorah, followed by a reception in the church hall; July 10 at 7 p.m. at the American Martyrs Retreat House in Cedar Falls for the parishes he served in that area, followed by a reception; July 23 at 10:30 a.m. at St. Francis Xavier Basilica, Dyersville, his home parish, followed by a dinner for family and close relations; and July 24 at 7 p.m. at St. Joseph Parish, Bellevue, followed by a reception. Father James Chappell was born Jan. 6, 1941, in Dubuque to John and Rita (Honkamp) Chappell. He graduated from Loras College and completed his theological studies at Mt. St. Bernard Seminary in Dubuque. He was ordained June 3, 1967, at the Cathedral of St. Raphael in Dubuque by Archbishop James Byrne. He did graduate work at the Aquinas Institute, Iowa State University, the University of Notre Dame and St. Louis University. After temporary assignments at St. Pius X Parish in Cedar Rapids and St. Patrick Parish in Waukon, he served as associate pastor of St. Cecilia Parish in Ames, 1967-69. He was a member of the faculty at Loras College in Dubuque, 1969-79, and Clarke College in Dubuque for 5 1/2 years. He served as associate pastor of Resurrection Parish in Dubuque, 1979-83, and of St. Joseph the Worker Parish in Dubuque, 1983-86. He was pastor of Sacred Heart Parish in Monticello, 1986-92, and Sacred Heart Parish in Dubuque, 1992-2004. In 2004, he was appointed administrator of Sacred Heart Parish in Maquoketa, becoming pastor there the following year. In 2006, he was also given charge of St. John Parish in Andrew and St. Lawrence Parish in Otter Creek, where he served until his retirement in 2011. Father Chappell will celebrate his jubilee with a Mass at St. Patrick Parish in Dubuque, his home parish, on Saturday, July 15, at 6 p.m., followed by a reception at Foley Hall in the church basement. Father David P. Remy was born March 22, 1941, in Dubuque to Eldon and Aurelia (Reuter) Remy. He had one sister, Patricia, who recently died. He has two nephews and one grandnephew. He was a member of Sacred Heart Parish and graduated from the parish school in 1955. He was a member of the last graduation class of 1959 from St. Columbkille High School. He earned his B.A. degree from Loras College in 1963. He was awarded an M.A. degree in theology from Aquinas Institute in 1965. He was ordained as a priest for service in the Archdiocese of Dubuque by the Most Rev. James J. Byrne at St. Raphael Cathedral on June 3, 1967. Father Remy received his first assignment to St. Matthew Parish in Cedar Rapids and served as an associate pastor from 1967-1969. He was sent to Aquin High School in Cascade and resided at St. Peter Parish, Temple Hill, from 1969-1973. He was transferred to the faculty of Regis High School Cedar Rapids from 1973-1981, continuing as associate faculty while being assigned as chaplain to Sacred Heart Convent and also administrator of St. Isidore Parish, Springville. During this time, he ministered to those chemically dependent in AA and the Sedlacek Treatment Center at Sacred Heart Hospital, Cedar Rapids. In 1985, Father received permission from Archbishop Daniel Kucera to enter the United States Navy. As a priest-chaplain in the Archdiocese for the Military Services, USA, he served at various Naval-Marine Corps stations and in ships around the world until July 2005, when he was honorably retired from his last duty station in Pensacola, Florida. He was given permission to remain in Pensacola and serve military chapels and parishes within the diocese of Pensacola-Tallahassee, Florida, from 2005-2011. Reaching the age of 70, he was retired by Archbishop Jerome Hanus from active assignments. He moved to Fort Myers, Florida, and continues to minister as a cruise ship chaplain associated with the Apostleship of the Sea, USA. He also volun­teers with Hope Hospice as a member of the Veterans’ Valor award program for veterans in the hospice program. “Jesus erased the distraction to loving when He advised us ‘not to judge,’” said Father Remy. “Jesus has personally become real through His forgiving of my failings and witnessing the multitude of miracles he works daily in our lives through the blessings of my assignments in teaching, sacramental ministry and military chaplancy. Father Mark McGovern was born March 4, 1941, in Algona to Joseph and Verona (Weisbrod) McGovern. He attended grade school in Lone Rock and Riceville and high school in Algona and Riceville, graduating from Riceville public school in 1959. He graduated from Loras College in Dubuque in 1963 with a bachelor’s degree in philosophy. After spending four years in the seminary at Mount Saint Bernard Seminary in Dubuque, he was ordained to the priesthood by Archbishop James J. Byrne in 1967. He was associate pastor of St. Joseph Parish in Marion, 1967-68; and also served on the faculty of Regis Catholic High School in Cedar Rapids. He was associate pastor at St. Benedict Parish in Decorah, 1968-70; St. Mary Parish in Manchester, 1970-71; and Holy Ghost Parish in Dubuque, 1971-74. During this period, he taught at Ossian de Sales High School, St. Mary School, and Holy Ghost School. In the fall of 1976 he was accepted as a graduate student in the Department of Philosophy at Saint Louis University. After receiving the Ph.D. in January of 1982, he served as chaplain for the Sisters of St. Joseph of Carondolet in St. Louis, Missouri, until he secured the position of chaplain for the students at Cardinal Newman College, St. Louis, for the 1983-84 academic year. In 1983 he accepted the position of assistant philosophy professor at Cardinal Newman College in St. Louis. 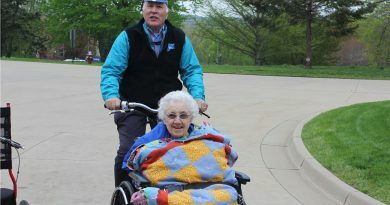 However, the school closed in 1985, so after finishing a course for the Sisters of the Martyr, St. George in Alton, Illinois, for which he was contracted, he was asked by Archbishop Daniel W. Kucera, OSB, to return to the Archdiocese of Dubuque. From 1985 to 1987, he was a teacher at Notre Dame High School in Cresco. For two of those years he was associate pastor at Assumption Parish in Cresco and for two years, 1987-1989, pastor in Little Turkey, with its mission of Reilly Settlement. In 1989 he was assigned as pastor to St. John Parish in Coggon and St. Stephen Parish in Central City. In addition to being pastor of two parishes, he was assigned as the priest designated to celebrate Mass for the inmates of the state reformatory in Anamosa. 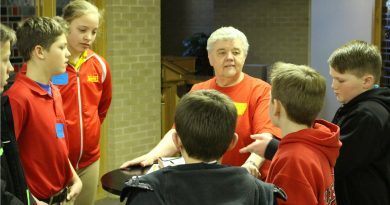 In 1990 a resident pastor was assigned to St. Stephen, so he was assigned to two parishes in addition to St. John — St. Joseph Parish in Prairieburg and Immaculate Conception Parish in Castle Grove. In 1992 Immaculate Conception was assigned to another parish. In 1993, he accepted a position as adjunct professor of philosophy at Rockhurst College in Kansas City, Missouri. After teaching there and at Baker University part-time for one year, he returned to the Archdiocese of Dubuque, taking on the role as pastor of St. Patrick Parish, Anamosa, in August of 1994. Part of the assignment involved a weekly Mass at the reformatory in Anamosa. In March of 1995, he was assigned as pastor of the Anamosa parish which has a school of grades K-6. In September of 1996 he was assigned as pastor of Immaculate Conception Parish, Fairbank, and chaplain to the Mental Health Institute in Independence. From 2000-2001, he was pastor of St. Mary, Eldora, and St. Mark, Iowa Falls. He also requested to be assigned to Hispanic ministry and acted as a substitute for Spanish Masses when needed. Thus, for a time, he celebrated Mass at various times at St. Joseph, Waterloo; St. Mary, Marshalltown; and St. Patrick, Dubuque. Later he volunteered to celebrate the Spanish Mass in Postville on a regular Sunday basis. He was associate pastor of Nativity Parish and chaplain at Stonehill Care Center, both in Dubuque, 2001-2002. He was associate pastor in Dyersville, with duties in Worthington and Dyersville, 2002-2004. After being on leave, 2004-2006, for health reasons, he served as assistant to the ­director of the archives of the Archdiocese of Dubuque from 2007-2011. He now lives in Cedar Rapids. In retirement, he enjoys the study of genealogy and writing. As part of the celebration for his jubilee, a play he wrote on his family’s Irish-American history, “Grandpa James Comes to America,” will be performed at a family gathering.